Automotive Dealer Supplies > Soaps, Cleaners & Specialty Products > Force Cleaner Degreaser - 55 Gal. 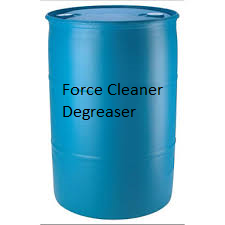 Force Cleaner Degreaser - 55 Gal. This is a strong alkaline degreaser . Activates with water. The more you cut it the better it works. We have used this formula for 25 years. Cleans and degreases, interiors, tires, engines or restaurant equiptment. All purpose cleaner.